What started out as a huge flopping fail, ended in happy success. In the case of this particular recipe, anyways! I was thinking I should take photos of my recipe fails and do a post round up with them. Mistakes are frustrating, but a fact of life. I’m only human. I thought that would be a neat post to share. Next time, I have a fail, I’ll remember to take a pic of it for you! My initial plan was to make a ginormous Cranberry White Chocolate Cheesecake. 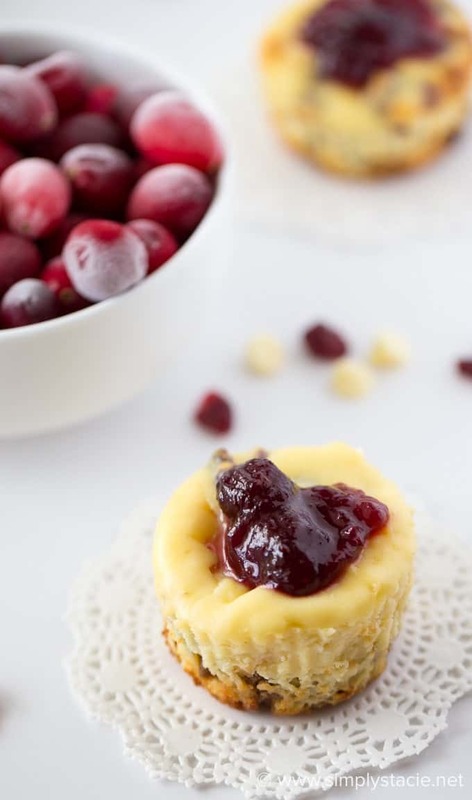 I’m talking a thick, dense cheesecake filled with white chocolate and dried cranberries. I used 5 blocks of cream cheese. Yes, five! It went in my springform pan and baked in the oven for over an hour. It looked done. The topping was browned and the cheesecake was set. I thought I had a winner. Boy, was I wrong. When I went to remove the springform pan, all hell broke loose. One side of the cheesecake started collapsing and you could tell the filling was not cooked. I wanted to cry because it looked so good until the pan came off. It was a sad moment. I redeemed myself the next day by doing something a little easier. I like easy recipes as you probably noticed. These little guys turned out beautifully and made my first cheesecake fail a distant memory. This recipe was also an entry into a holiday contest. I don’t normally enter contests like this one, but the prize was enticing: a Vitamix blender. I want one! It’s not a voting contest thankfully. I dislike them – too much drama! Check out the contest details if you want to enter yourself. My crust was a mixture of melted butter and Nature’s Path Love Crunch Dark Chocolate & Peanut Butter granola. If you can’t find that particular granola where you live, you could substitute another type. They are rich and indulgent – perfect for the holidays! I topped them off with a dollop of cranberry sauce to make them a little more festive and pretty. They were a hit with my family! 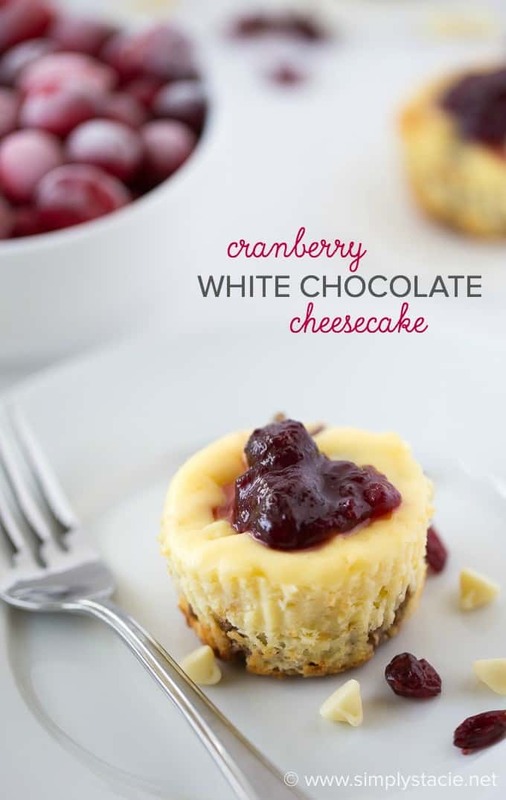 For more cheesecake recipes, try Brownie Cheesecake Cups, Cheesecake Stuffed Cinnamon Rolls, Gooey Cheesecake Cookie Cups, Cherry Cheesecake Pizza, Cherry Cheesecake with Oreo Crust, Lemon Cheesecake Mousse, Biscoff Cinnamon Roll Cheesecake, Berry Cheesecake Trifle, Maple Syrup Cheesecake, Strawberry No-Bake Cheesecake, White Chocolate Cranberry Cheesecake Bars and Caramel Pecan Cheesecake. Whoa. I didn’t realize how obsessed I was with cheesecake until now! What is your favourite cheesecake recipe? A festive dessert that’s mini in size, but huge on flavour! Rich cheesecake filling packed with white chocolate chips and cranberries nestled on a chocolate granola crust. Preheat oven to 350F. Add cupcake liners to a cupcake pan. Set aside. In a medium sized bowl, mix together the butter and granola. Add about a teaspoonful to each cupcake liner, spreading across the bottom. In a large bowl, beat the cream cheese, vanilla extract and sugar on medium low until combined. Add in eggs, one at a time, continue to beat on low. Stir in dried cranberries and white chocolate chips. Fill cupcake liners with mixture, about 3/4 ways full. Bake for 25 minutes or until cheesecake is set. Cool completely before removing from the cupcake pan. Refrigerate for 2 to 3 hours for the cheesecake to set. 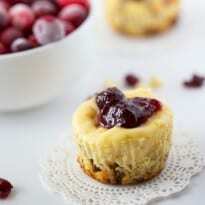 When ready to serve, top each cheesecake with dollop of cranberry sauce, if desired. If you can’t find this particular granola, feel free to substitute another kind. 5 bricks of cream cheese! Oh man, that is an expensive fail – sorry to hear! The second attempt may have been worth it, though. They look really good! I cannot make up recipes- I need to follow directions as the chemistry of food confounds me. And I agree about voting contests- ugh! I will throw someone a vote if they ask, but I won’t enter myself. They remind me of high school, haha. I don’t need that kind of rejection in my life! My favorite cheesecake recipe is a bit of a shortcut recipe–the 1-2-3 Phiadelphia cheesecake recipe from the cream cheese package! Hahaha (you know, 1 pound cream cheese, 2 eggs, 1/2 cup sugar and vanilla–poured into a prepared graham cracker crust and baked)! I admit I am a bit of a cheesecake purist with the original flavor as my favorite but I have made an exception for Oreo cookie cheesecake. Orange and cranberry is one of my favorite fall flavor combinations, I use it for my oatmeal cookies–dried cranberries and grated orange zest in place of raisins and cinnamon. Looks so yummy. Perfect treat for over the holidays! 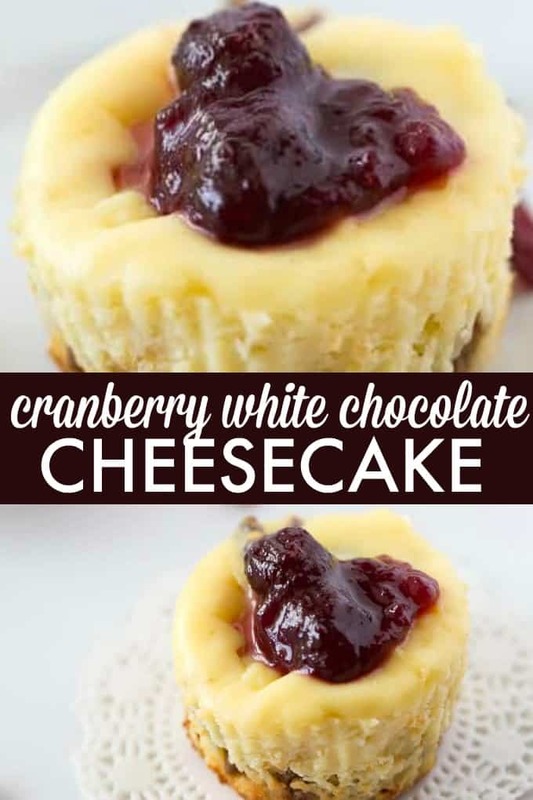 The Cranberry White Chocolate Cheesecake with cranberries and white chocolate looks so delicious and such a pretty recipe to make for the Holidays. I love the topping! yummy! Love that the recipe uses Nature’s Path Organic Love Crunch! Love these small cheesecakes! Perfect for parties (like the one I am hosting tomorrow). I will have to try it. Thanks. These look incredible! 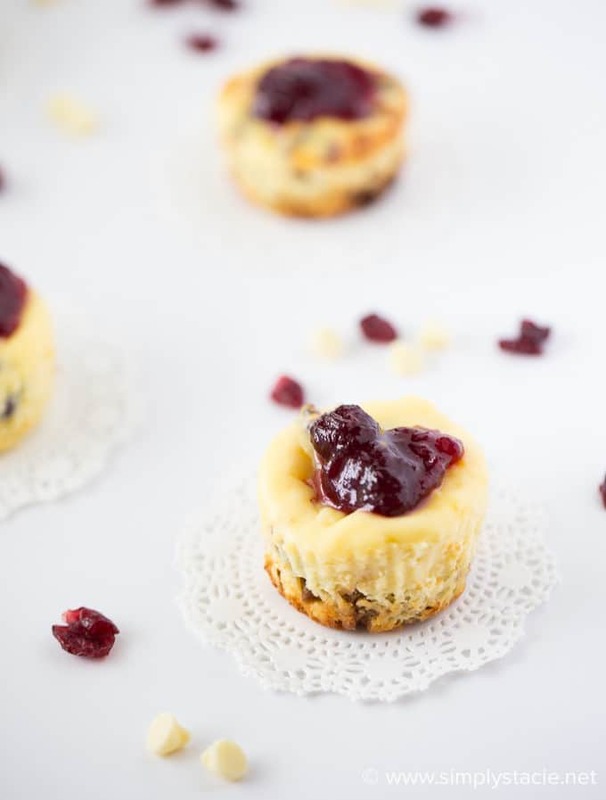 I love cranberry and cream cheese, so I bet these are amazing! Thank you for sharing them at the #SmallVictoriesSundayLinkup! Your recipe is featured on Full Plate Thursday this week! Enjoy your new Red Plate and have a very special New Year!